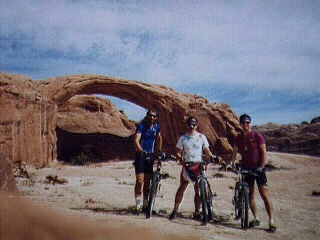 In May 1996 Harold and George and I went to Moab. The mountain biking mecca of Utah. We did the normal recommended circuit and had a blast. 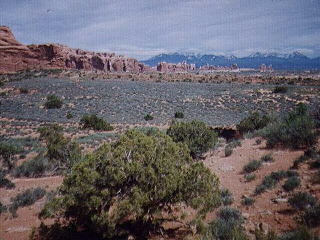 Slickrock trail. Petrefied sand dunes for miles and miles. We got there early (highly recommended) and beat the crowd. We were amazed at how full the parking lot was when we finished the ride. 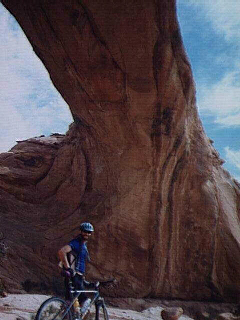 Traction on this rock was unbelievable. We cleaned most of the route except for some sandy spots and a climb early in the ride. Most rides will end in early afternoon so we did some exploring. 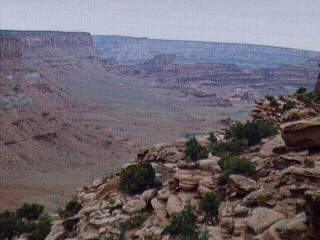 Check these places out: Drive up to Long Canyon and then to Dead Horse Point, Day hike through Fisher Towers to the view point, Drive up to Lasal Mountains via road past Slickrock trail, Chotchka shopping (limitless).